It’s a long road to a latitude of 30 degrees South to stand at an elevation of 9000 feet up on the mountainous spine of South America. Over a period of 11 years, I visited telescopes in Chile to collect research data, before I moved to Chile to live and work there for 5 years. This is a brief look at the journey an astronomer makes to telescopes in Chile. I’m both amused and nostalgic for having once been immersed in the “game”: professional research astronomy, a seriously competitive human enterprise carried out in the open arena with public money. To obtain research data, I submitted and chased successful proposals to telescopes at various locations around the world; some of those telescopes are in low earth orbit. Some success meant becoming accustomed to remote locations, beautiful scenery, and the isolation. The best places to build world-class research telescopes are not necessarily conducive to living conditions. A variety of stations scattered around mountain tops track weather conditions over a period of years. Telescopes are built at locations where there is little rain or moisture; where there is minimal effect of light pollution from neighbouring urbanized areas; and where the air flow overhead is smooth, horizontal, and laminar, producing the sharpest possible image-quality for the study of very faint astronomical sources, from low-mass stars in our own galaxy to the most distant galaxies. These conditions are met in Chile. A number of telescopes have been built by a number of European, North American, and South American nations in the Andes between northern and north-central Chile along a stretch of the Atacama desert. For most, the trip to Chile is neither trivial nor short. Most fly the overnight red-eye flight into the national capital city of Santiago (SCL), followed by a short one-hour hop to La Serena (LSC). Leaving the airport and heading east, Ruta 41 winds its way into the Elqui river valley. 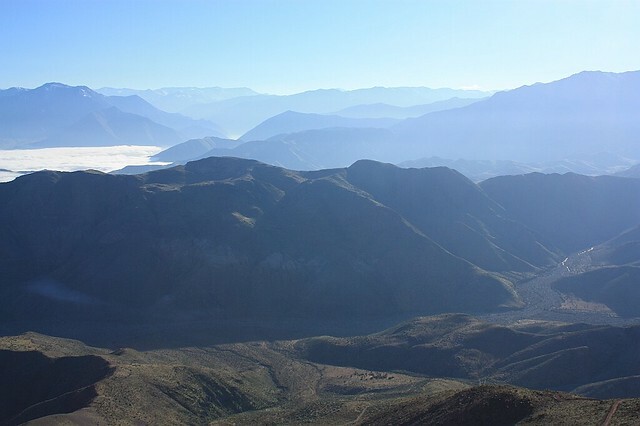 Foothills appear taller, with mountains in the distance signaling the border region with Argentina. Driving past the dam and artificial lake, road signage marks a turnoff onto a dirt road heading south. The manned gate controls the flow of approved vehicles in and out of the area. I’ve been here countless times. If I’m in the back seat, I slip into a snooze, and every straight-away, bump, turn and bend in the road will be as familiar in sleep as I am awake. I might see a few vehicles in the other direction, returning to La Serena. If I’m lucky to have the wheel, I’ll stop at various places to enjoy the view. Sometimes, it’s me, the vehicle, and a lot of red-brown dust and dirt. I’m surrounded by smooth brown round-top hills, with jagged snow-capped peaks farther to the east. I’m accompanied by the whistling of the desert breeze; the only other company is cactus, scrub, and brush. This is either blessing for being in a remote part of the world or curse in the solitude for miles around. Eventually, the graded dirt road comes to a ‘T’: one section heads north to telescopes at Cerro Tololo, while the other section leads south to Cerro Pachón. I have to be aware of the road and surroundings; it’s dangerous to underestimate the desert. Knowledge of the landscape is easier over time, and years of living in La Serena have secured memories more firmly. It’s the middle of the desert, and if there’s an accident, days might pass before encountering another vehicle. Every vehicle must have a working two-way radio in contact with gate control. Sometimes the desert reaches out and kills; accidents have claimed vehicles and lives. These dirt roads can be unforgiving with sudden dips, slippery switchbacks, and blind curves. Driving can be “breathtakingly entertaining”, especially at night. Winter snow and ice on the unpaved surface can be challenging, and there’s several hundred meters of drop beyond the unguarded shoulder on the other side of the road. The domes finally appear, indicating our arrival at the observatory. Up on Pachón, walking is a little slower, breathing a little more laboured, the air a little thinner. I’m at 2700 metres or about 9000 feet above sea level. Dome enclosure for Gemini South (left), north-northeast to Orion (center) and Canis Major (right). An “observing run” (or shift) at the telescope can last a few nights. Naturally, most of the work is done at night, with telescopes open to the sky and detectors ready to receive precious photons. For many, there’s insomnia, and some forego sleep in the morning hours to work on their data or their latest paper. Switching from day to night can take a couple of days for adjustment. Often I’ll see desert foxes sleeping by day, and I wonder whose lives are easier. At the mountain dormitories, I have a room with a warm bed, and the food’s good up top. The view’s pretty damn good, too. I’m more than happy to share the desert and skies with the furry four-legged tenants of the Atacama. 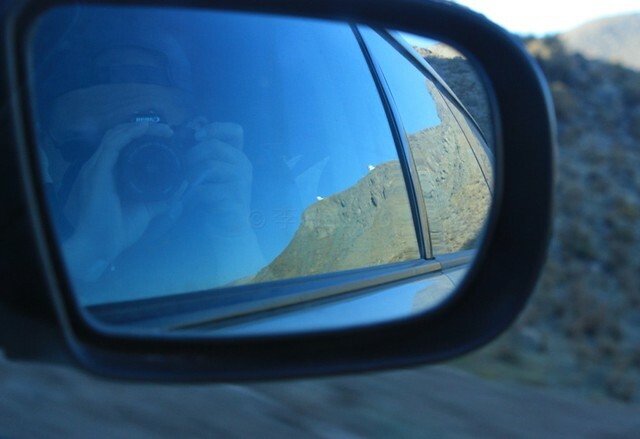 Trouble comes when I leave and say “hasta luego” to the desert and mountain view. Time and distance have provided valuable perspective after leaving astronomy at the end of 2011. I miss the people with whom I worked, and I miss the panoramic views. Change is happening; there’s no clearer time than now. 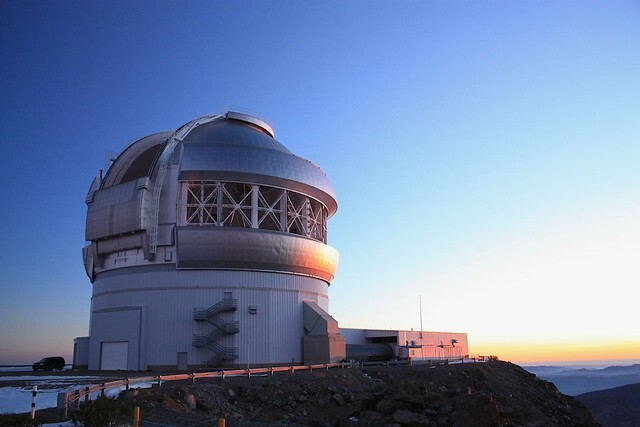 The Pachón summit hosts Gemini South and the SOAR Telescope. 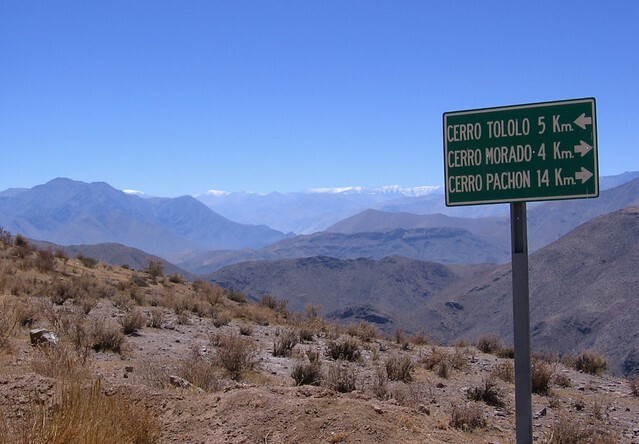 A one-way drive to Tololo or Pachón is about 90 minutes from La Serena. A version of this post appears on Maptia. I made the photos between 2006 and 2009. This post appears on Fotoeins Fotopress at fotoeins.com as http://wp.me/p1BIdT-5OG. What an incredibly beautiful place. 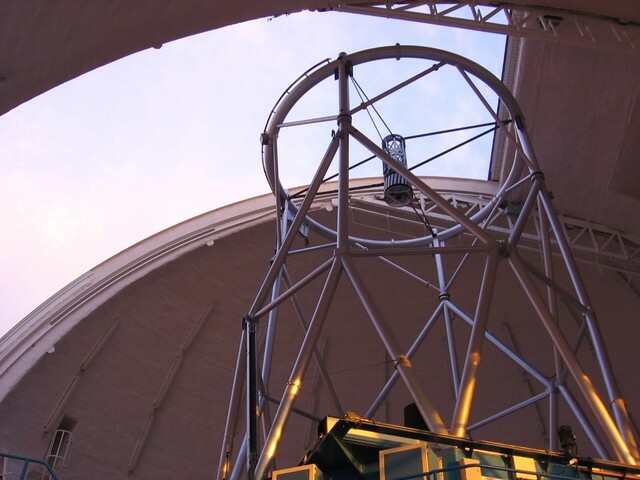 Thanks for sharing a bit into your life as an astronomer! I miss the place; I hope that also comes through in the piece. Thanks for reading and for your comment, Adelina! Gorgeous! Love how the mountains are layered and go on for what seems like forever. Hi and thanks, Maria! What I learned after many trips and 5 years there is that the “layers” depend on how much desert dust is blown up into the air, the time of day, the time of the year, and the ambient light. In other words, you can come back to the same place day after day, and the same view will look different. Amazing variability! Thanks for reading and for your comment! Thanks! Even if it felt like a “chore” sometimes, the 90-minute ride is mercifully short from La Serena, as others have it worse. I miss the trip into the “hills”. Stunning place, Henry! 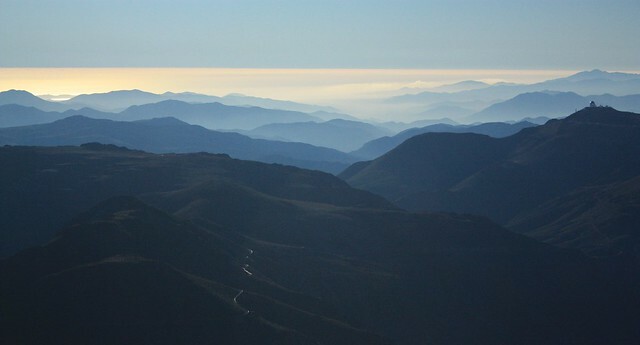 I don’t really have a bucket list but if I had one, the Andes would be somewhere at the top of that list! Thanks for your comment! With Andes so “close” you can reach out and touch them, the narrow width and the long stretch of Chile will make for fascinating discoveries.